Our goal at cloudhiking is to help you get outdoors. We try hard to give the most current information for each adventure. If you need more information, we might have an answer, just ask! Each Adventure Guide is written to entice you to get out there. When we look at the pictures, it makes us want to re-hike the trail or re-ride the greenways. When we look at the maps, we dream of the areas. We hope the Guides do the same for you. Finally, a new map! 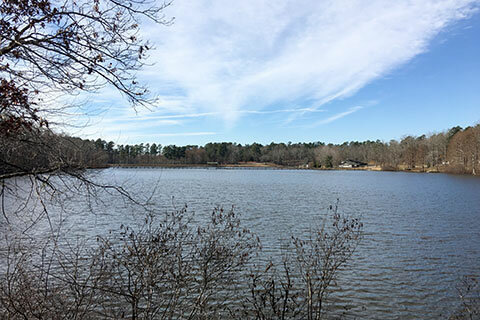 Recently we visited Chickasaw State Park, Savage Gulf (re-hiked to confirm data on Collins Rim Trail), and Bledsoe Creek. The data obtained from the Chickasaw trip was used to make a new map and guide of the area. The trips to Savage Gulf and Bledsoe Creek were just to update current maps. Chickasaw State Park is a great destination. South of Jackson, TN, the Park is nested within the boundaries of Chickasaw State Forest. There are old CCC buildings and structures, great trails around Lake Placid, camping, cabins, and a restaurant. It's worth a visit! The Mount Audubon (Indian Peaks Wilderness - Colorado) Trail Map is complete and posted. Audubon is a fun 13,000 feet mountain with easy access. It is a great acclimating hike. A revised Cummins Falls State Park Trail Map has been posted. Cummins Falls is located near Cookeville, TN. We have not posted new maps or guides to the site in a while. Sorry, but it is not because we are not working on new maps. We are working on a major product that is taking most of our map creation time from us. You will be hearing more about the new maps soon. Thanks for your support. We have added a couple of new pages (links) to the Virgin Falls Trail pages. By request, we added a description only (no photos) guide to the area (the text is unchanged) and also provided a geo-spatial pdf map for Virgin Falls. The map file may be loaded into a smart phone with a geo-pdf reader, such as Avenza PDF. Virgin Falls is a great Natural Area near Sparta, TN. It is a must see. (01/20/16) Chickasaw State Park Guide and Trail Map - Chickasaw is located south of Jackson, TN on Hwy 100. The Park has over six miles of trails which form over 7.5 miles of hiking (some sections have to be walked twice - out and back, other sections are walked more than once to make loops). A guide and geo-pdf map are included. (08/15/15) Mount Audubon Trail Map - Indian Peaks Wilderness, Roosevelt National Forest, Colorado. At 13,223 feet Audubon stands alone on the eastern edge of the Indian Peaks. There are great views of the Continental Divide to the west and Rocky Mountain National Park (including Longs Peak) to the north. The trail is mostly Class 1 with a bit of Class 2 on the final stretch leading to the summit. The trail is dog friendly, but dogs must be on a leash at all times. (07/14/15) Cummins Falls State Park Trail Map - Tennessee State Park (the link is to the Cummins Falls page, the map links are on Page 2). A great, small, State Park with the reputation as having one of the best swimming holes. The map is revised to include the Upstream Trail and options for either the PDF or Geo-PDF maps. (04/16/15) Guide to The Loch, Glass Lake, and Sky Pond - Rocky Mountain National Park. The map was competed last month and finally, we were able to finish the guide. Enjoy the guide and plan for a hike! (04/02/15) Deer Mountain - Rocky Mountain National Park - (map only) - updated Deer Mountain Trail Map to include the North Deer Mountain Trail, East Deer Mountain Trail, South Deer Mountain Trail, plus other trails to the north and south of Deer, and the standard Deer Mountain Trail. (03/09/15) Glacier Gorge - Sky Pond Trail Map - Rocky Mountain National Park - (map only) - Trail map of Glacier Gorge Trailhead trails. Map includes Glacier Gorge, Sky Pond, Andrews Glacier, Black Lake, Mills Lake, The Loch, Glass Lake, Lake Haiyaha, Emerald Lake, Dream Lake and more ... A great map for the popular eastern-central section of Rocky Mountain National Park. (03/01/15) Paintbrush Divide Loop Trail - Guide to a great tour of Grand Teton National Park. The 18.85 mile loop climbs Paintbrush Canyon and descends the North Fork of Cascade Canyon to Cascade Canyon and then closes the loop with a short walk along Jenny Lake. (02/19/15) Savage Gulf Trail Map - South Cumberland State Park - (map only) - 2nd update to Savage Gulf, specifically the South Rim Trail from Savage Gulf Trailhead. We only have one Savage Gulf Trail Map, the updated map has all of the corrections - see below (02/06/15). (02/09/15) Mount Yale Trail - Trail Guide to the Southwest Slopes route on Mount Yale. It is the standard route on Mount Yale. (02/06/15) Savage Gulf Trail Map - South Cumberland State Park - (map only) update for the Map of Savage Gulf Natural Area, a premier hiking destination. The update is only for about 9 miles of trail, Greeter Trail (from Alum Gap to Boardtree Falls, Laurel Trail, Big Creek Rim, Stone Door Trail. We only have one Savage Gulf Trail Map, the updated map has all of the corrections - see above (02/19/15). (02/03/15) Mount Massive Trail - Trail Guide to the East Slopes route on Mount Massive. The route is the standard for Mount Massive. It is a Class 2, classic. (01/30/15) Mount Yale Map - (map only) - Chaffee County, Colorado, Sawatch Range. Mount Yale is one of the Collegiate Peaks. Located west of Buena Vista, CO, Yale is popular due to the easy (paved) trailhead access, improved trail (thanks CFI), and a great upper slope and ridge. Yale is a great hike, we hope the map is well used! (01/27/15) Mount Massive Map - (map only) - Lake County, Colorado, Sawatch Range. Mount Massive sits a few miles north of Mount Elbert (the highest summit in Colorado) but Massive looks bigger. Massive is so huge, it dominates the view from nearby Leadville. The mountain begs you to climb it. Enjoy the map, a trail guide is soon to come! (01/20/15) Pogue Creek Canyon Natural Area Map - Tennessee State Natural Areas - Tennessee State Parks - a new trail to the Canyon Overlook and hopefully more trails will be added to the area in the coming years. (1/11/15) Jenny Lake Trail - Grand Tetons National Park - a great loop route around the iconic lake. Guide includes a sidetrip to Hidden Falls and Inspiration Point. The photos alone are worth a visit. (12/30/14) Paintbrush Divide Loop Trail - Grand Teton National Park (map only) - the loop hike route that climbs Paintbrush Canyon, crosses the divide, and descends the North Fork of Cascade Canyon and Cascade Canyon to return. Also included are a few popular lake hikes included: Jenny Lake, String Lake, Leigh Lake, Bearpaw, Trapper, Holly Lake, and Lake Solitude. (12/04/14) Savage Gulf Trail Map - South Cumberland State Park - (map only) Map for the Savage Gulf Natural Area, a premier hiking destination. The map is not complete. We have not recorded all of the necessary trail data, but plan to be adding to the map over the winter months. On trails where we did not have GPS track logs, we used the TDEC GIS Data. (11/06/14) Onahu Creek - Green Mountain Loop - Rocky Mountain National Park - a 7.60 mile loop route that climbs Onahu Creek to Big Meadow and then returns to the Kawuneeche Valley. The route makes an excellent day hike or overnight trip. (11/01/14) The Loop - Rocky Mountain National Park - the loop route of the North Inlet Trail and Tonahutu Creek Trail from Grand Lake, CO to the Continental Divide on Flattop Mountain. The route is above treeline for more than seven miles! The Loop is the premier backpacking destination in the Park and is part of the Continental Divide Trail. (10/26/14) Tonahutu Creek Trail - Rocky Mountain National Park - The route from Grand Lake up Tonahutu Creek to Big Meadow and then east to Granite Falls and Haynach Lake Junction. The route turns at the Haynach Lake Trail and follow it to Haynach Lake. the Tonahutu Lake Trail is the third leg of the Loop. (10/21/14) North Inlet Trail - Rocky Mountain National Park - The popular route up the North Inlet from Grand Lake. The guide includes Summerland Park, Cascade Falls, Big Pool, Ptarmigan Creek, North Inlet Junction, Lake Nokoni, and Lake Nanita. The trail to North Inlet Junction is the first leg of the Loop. (10/14/14) The Loop - Rocky Mountain National Park - West (map): the North Inlet and Tonahutu Trails plus Haynach Lake Trail, Lake Nanita Trail, Green Mountain Trail, and Onahu Creek Trail. The must do Loop route in Rocky Mountain National Park. 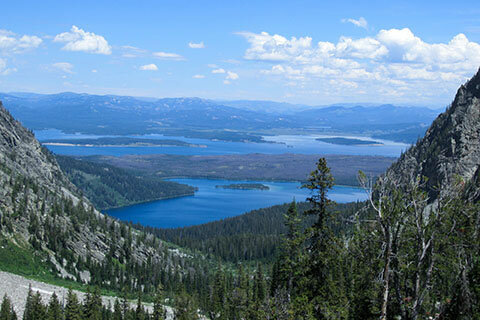 (09/18/14) LSR - Phelps Lake Trails - Guide - guide to the Grand Teton National Park's popular moderate route that leads from the Preserve's Interpretive Center to Phelps Lake, goes around the lake, and then returns. Great photos! (09/13/14) LSR - Phelps Lake Trails - Map - map to the Laurance S Rockefeller Preserve trails and the Phelps Lake Trail in Grand Teton National Park. Trails starting at the Interpretive Center Trailhead lead to miles of great trails and great views. (08/26/14) North Mount Elbert Trail - trail guide to the popular route up the Northeast Ridge of Elbert. (08/20/14) Skills - links to the many skill related pages (and some stories) from our Metro to Mountain Journal. Many series and individual entries. Check it out! (08/20/14) Mount Elbert - (Map) Over the summer, while staying in Leadville, CO we re-hiked Mount Elbert, Colorado's highest peak. It was a fun hike and now we have the map complete. Enjoy! Oh, the guides will soon follow - we did two trails on the peak. (05/05/14) Sandbeach Lake - Rocky Mountain National Park. Another Wild Basin Area lake. With close access to the Park Entrance the trail climbs 4.3 miles to the lake. Most of the trail is moderate. The lake has great views of Mount Meeker's southern flanks. (04/30/14) Finch Lake - Pear Lake in Rocky Mountain National Park. Our first guide to the Wild Basin area of the Park. 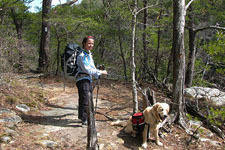 The lakes are about 4.5 miles and 6.5 miles from the Finch Lake Trailhead on good trails. The lakes are a must see. (04/16/14) Wild Basin in Rocky Mountain National Park - (map only) the trails of the Wild Basin area of the Park. Many great trails to alpine destinations. We also hope to finish a couple of guides to the area before summer. (3/28/14) Gregory Ridge Trail to Gregory Bald - From Gregory Ridge Trailhead the trail follows Forge Creek to the campsite and then climbs the ridge to Ridh Gap and the Gregory Bald Trail. (3/13/14) Wolf Ridge Trail to Gregory Bald - Another guide to Gregory Bald from the Twentymile Trailhead. (2/17/14) Long Hungry Ridge Trail to Gregory Bald - Guide to Gregory Bald route from the south, Twentymile Trailhead. (2/7/14) Gregory Bald (map only) - Just uploaded the Gregory Bald Trail Map to Great Smoky Mountain National Park. The guide is soon to come. We also intend to hike the trails from Cades Cove and complete the map this Spring. Any suggestions are welcome. Thanks for your support. Happy trails to all, hope to see you on the trails somewhere. Chickasaw State Park - Henderson, TN. Guide to trails of the State Park. The Loch, Glass Lake, Sky Pond - Rocky Mountain National Park. One of the great mountain lake hikes. Paintbrush Divide Loop Trail - Grand Teton National Park. The Route includes Paintbrush Canyon, North Fork of Cascade Canyon, and Cascade Canyon. 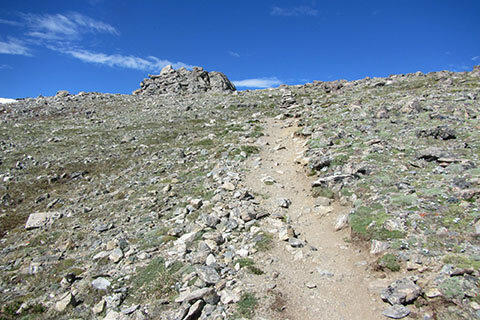 Mount Yale Trail - Sawatch Range, Colorado - standard route on Mount Yale, 14,196'. 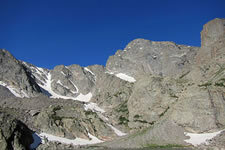 Mount Massive Trail - Sawatch Range, Colorado - the standard route climbing the 14,421' Mount Massive. Jenny Lake Trail - Grand Teton National Park - the route around the popular lake. Guide includes the route to Hidden Falls and Inspiration Point. Onahu Creek - Green Mountain Loop - Rocky Mountain National Park - the route follows the beautiful Onahu Creek and then loops around to Big Meadow. The Loop - Guide - Rocky Mountain National Park - closing the North Inlet Trail and Tonahutu Trail with the above treeline section of this great route. Tonahutu Creek Trail - Guide - Rocky Mountain National Park - another west side of the Park trail and the third section of the Loop. North Inlet Trail - Guide - Rocky Mountain National Park - popular west side of the park trail and the first section of the Loop. LSR - Phelps Lake Trails - Guide - Grand Teton National Park - popular moderate route around Phelps Lake. South Mount Elbert Trail - Sawatch Range, Colorado, trail guide to the East Ridge Route on Mount Elbert. 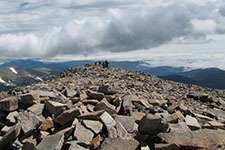 North Mount Elbert Trail - Sawatch Range, Colorado, guide to popular route that climbs the Northeast Ridge of Elbert. Map - Mount Audubon Trail Map - Indian Peaks Wilderness, Roosevelt National Forest, Colorado - geo-pdf map. Map - Cummins Falls State Park Trail Map - Tennessee State Park (the link is to the Cummins Falls page, the map links are on Page 2) - Revised map and geo-pdf map. Map - Deer Mountain Trail Map - Rocky Mountain National Park - Trail map to Deer Mountain. The map is a major update to the old Deer Mountain map. For six months we planned the trip and in fifty-three days climbed the fifty-four peaks. It was a great summer adventure. There were things that we did right, things that we did wrong, and things that we just did because it was the next day! By the end of the summer we were fit and ready to climb, but also ready to be home in Tennessee. Thanks to all those who helped us complete our goals as well as all those who shared the experiences with us. We loved it. The original cloudhiking site chronicling our trip with descriptions of each route is still an important part of this site. 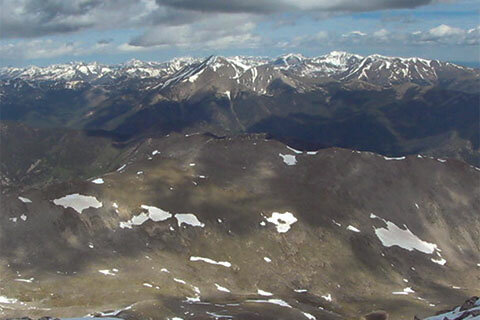 If you are interested in doing all or some of the Colorado Fourteeners, it is a must read. Oh, we have never edited our comments, so the candid remarks are still fresh.